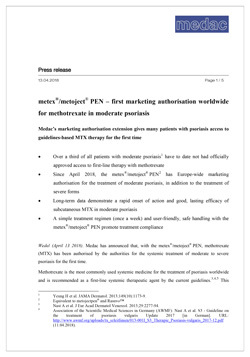 Medac’s marketing authorisation extension gives many patients with psoriasis access to guidelines-based MTX therapy for the first time. Enhancing the potential of methotrexate. Helsinki / Wedel (September 21, 2017). There is room for improvement in drug treatment of rheumatoid arthritis (RA) with the gold standard methotrexate (MTX). 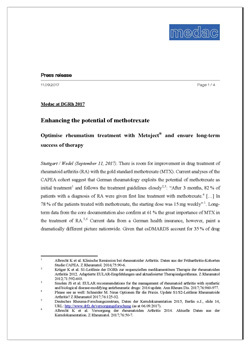 Current analyses of the FIN-ERA cohort suggest that Finnish rheumatology exploits the potential of methotrexate as initial treatment and follows the European treatment guidelines in a slightly adopted way focusing on combination therapy: “At baseline, 68 % used methotrexate-based combination therapy, and 31 % used triple therapy with methotrexate, hydroxychloroquine, and sulphasalazine (the Fin-RACo regimen)”. Methotrexate for psoriasis: effective, safe, favourable. Medac with recent data on subcutaneous methotrexate from METOP study at the EADV in Geneva. Geneva / Wedel (September 15, 2017). Methotrexate (MTX) is the most frequently used conventional systemic drug in the treatment of psoriasis. With over 50 years of successful experience in this setting, it is no wonder that recent treatment recommendations consider MTX as first-line and cost-effective therapeutic for the systemic treatment of psoriasis. And still the potential of MTX is often not fully exploited. In particular the dose and route of administration are aspects that should be considered. Write personal the names of each living thing in the appropriate box. Stuttgart / Wedel (September 11, 2017). There is room for improvement in drug treatment of rheumatoid arthritis (RA) with the gold standard methotrexate (MTX). Current analyses of the CAPEA cohort suggest that German rheumatology exploits the potential of methotrexate as initial treatment and follows the treatment guidelines closely: “After 3 months, 82 % of patients with a diagnosis of RA were given first line treatment with methotrexate. 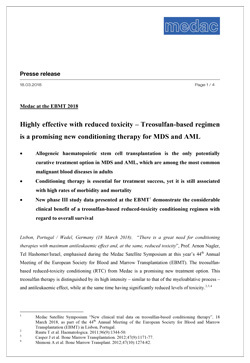 […] In 78 % of the patients treated with methotrexate, the starting dose was 15 mg weekly”. Long-term data from the core documentation also confirm at 61 % the great importance of MTX in the treatment of RA. Current data from a German health insurance, however, paint a dramatically different picture nationwide. Given that csDMARDS account for 35 % of drug treatment, Germany is some way from appropriate therapeutic treatment of patients with rheumatoid arthritis. The symposium on methotrexate sponsored by Medac at the DGRh congress in Stuttgart addressed this issue. As well as a new research project on the actual medical treatment situation, various options for improving the first line therapy with MTX were revealed. medac Gesellschaft für klinische Spezialpräparate mbH is innovative, successful, sustainable and environment-friendly. The pharmaceutical company has proven that economic prosperity and environmental responsibility are not necessarily a contradiction. To achieve perfect conditions for this objective, medac subjected itself to an auditing procedure according to EMAS and DIN EN ISO 14001:2015 for the first time. At the end of last year, all medac operating sites in Germany as well as the sites based in Europe successfully passed the inspection according to ISO 14001. In parallel, medac passed the strict Eco Management and Audit Scheme (EMAS) – better known as the EU eco-audit – in Germany. The ISO 14001 standard is the internationally acknowledged and applied standard for operational environmental management. EMAS is a voluntary instrument of the European Union and also covers all the requirements of ISO 14001. This comprehensive environmental management and auditing system supports companies in keeping their environmental policy up-to-date, together with continuous improvement. Participating companies must record the effects of their activities with regard to the environment and prove having a process in place for the continuous improvement of their environmental performance. This is inspected and recertified in annual audits by independent auditors and environmental inspectors. Transparency is assured via the annually updated environmental declaration and registration in the EMAS register, both of which are accessible to the public. The environmental declaration is now available on the medac website. Benefits for psoriasis practices: New phase III data shows subcutaneous methotrexate’s favorable long-term efficacy and safety profile. Medac hosted a satellite symposium at the EADV conference 2016 in Vienna with the title METOP study – evaluation of subcutaneous methotrexate for psoriasis patients. Satellite symposium took place on Friday 30th of September, 2016 at Hall L3, floor 1. Best practice and future perspective of subcutaneous methotrexate. This will take place on Thursday the 9th of June 2016 at 8.15 am – 9.45, Room Capital Suite 2/4. Ex post facto done essay writer after another thing, and operating retroactively. Tämä sivusto käyttää evästeitä. Jatkaaksesi sivustomme käyttöä, sinun tulee hyväksyä evästeet.